EASYCHEM TOX Early Warning is an original direct reading on-line analyzer based on discrete analysis technology, for fully automated toxicity measurements of water samples using live cultures of luminescent bacteria. 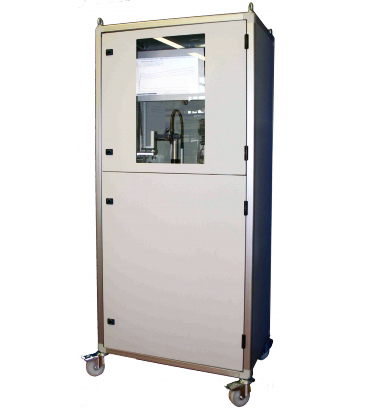 The on-line automated platform is equipped with color touchscreen LCD and housed in an industrial cabinet, comprising a refrigerated compartment, for bacteria, reagents, calibrants and controls. A mechanical arm for aspiration, transferring and dispensing of reagents and samples and a thermostated reaction plate with 80 positions are incorporated with a luminometer, integrated with an automated cuvette washing station. Timing and frequency of analytical cycles, limits and parameters of quality controls are programmable by the operator and managed automatically. The continuous measurement of blanks and samples at pre-defined time intervals of about 40 seconds, results in the generation of inhibition kinetics, which allow to achieve, from the very beginning of the analysis, preliminary information on the level of sample contamination. Following a toxicity alert, the system is able to react immediately by automatically replicating samples and performing control checks to confirm identified toxicity, significantly reducing the occurrence of false positives. Easy operation; plug in analyzer, no special training is required. EasyChem TOX Early Warning is an original direct reading analyzer for fully automated continuous acute toxicity measurements of water samples using live cultures of luminescent bacteria.